Psoriatic arthritis is a form of inflammatory arthritis that usually affects people who have a skin disease called psoriasis. Approximately 1 million Americans currently have psoriatic arthritis – a progressive disease that can cause serious joint damage. It is possible to develop this condition without first seeing signs of psoriasis; however, having psoriasis is the biggest risk factor for this form of arthritis. The other most prevalent risk factors include having a family history of the disease and being between the ages of 30 and 50. It’s also possible for those with a genetic predisposition to the disease to receive a diagnosis after suffering from trauma or battling a bacterial or viral infection. The National Psoriasis Foundation indicates that up to 30 percent of psoriasis patients will eventually see their condition transition into psoriatic arthritis. Therefore, psoriasis is the first early warning sign, especially if it’s a severe case. Even if you don’t have psoriasis, you should be aware that the following symptoms may indicate the presence of psoriatic arthritis. 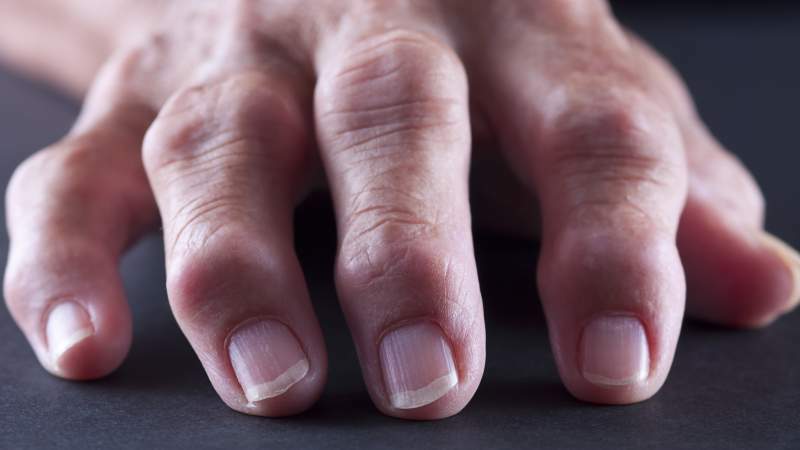 The presence of dactylitis, which is more commonly referred to as sausage fingers, is found in approximately 50 percent of all psoriatic arthritis sufferers – afflicted individuals will experience painfully swollen fingers or toes. This doesn’t happen in a symmetrical pattern, either, meaning that each joint could present a different amount of swelling. Additionally, it’s possible for only one digit to be affected. The Arthritis Foundation reports that half of psoriatic arthritis patients will develop axial arthritis. If you’re in this group, you can expect chronic pain that stems from above the tailbone and often spreads out into your hips and buttocks. Plantar fasciitis and Achilles tendinitis are common issues for people with psoriatic arthritis. You may also face stiffness, swelling, unusual warmth and an overall sensation of pain in your feet. Due to the previously mentioned dactylitis, you’re also highly likely to have extremely swollen toes at least part of the time. Joint pain is one of the primary indicators of any type of arthritis. In psoriatic arthritis, this is often accompanied by stiffness, tenderness, and swelling in the joints. Your joint pain won’t necessarily be constant, and it could affect different areas of your body at different times. Psoriasis Speaks urges anyone who has skin, otherwise known as plaque, psoriasis to visit their doctor immediately if their joints start to feel painful on a regular basis. Left untreated, this particular aspect of the condition can cause permanent and potentially crippling issues. Pain in and around the ankles is common. You might have difficulty sleeping due to this problem, but you can get some relief by sleeping with a pillow between your ankles. You can also relieve knee pain by putting a pillow between your knees. The National Psoriasis Foundation indicates that 80 percent of psoriatic arthritis sufferers will also develop nail psoriasis. This can lead to separation from the nail bed or nail pitting. In fact, nail pitting is often viewed as one of the earliest warning signs of psoriatic arthritis. Other issues may include nail discoloration, nail ridges and crumbling nails. If any of your joints feel warm to the touch, you need to get them checked out. This symptom is caused by inflammation in the body, and it could also cause the skin around the joints to become reddened. Many people with this autoimmune disease will notice warmth in the middle of their lower back. Do you feel tired even though you’ve slept? Does doing a mild amount of physical activity leave you exhausted? If the answer is yes, you might have the fatigue that’s often associated with psoriatic arthritis. Psoriatic-Arthritis.com says that half of patients battle moderate fatigue. Another 29 percent have severe fatigue. As the condition develops, it may greatly reduce your range of motion. This is especially prevalent in hands, wrists, fingers, toes, hips, knees and legs. There is no cure for psoriatic arthritis. If left untreated, you could end up with severe, permanent joint deformities and bone damage. Before treatment options can begin, your doctor will need to determine exactly what you’re dealing with. It’s common to diagnose psoriatic arthritis by doing a physical exam, taking x-rays and doing a blood test to rule out rheumatoid arthritis. Here are some of the most common treatments to manage symptoms. The pain and inflammation that accompanies psoriatic arthritis can sometimes be treated with over-the-counter NSAIDs such as Aleve, Motrin IB, and Advil. Since your immune response is out of control, your doctor may prescribe an immunosuppressant such as Cyclosporine or Azathioprine. Disease-Modifying Antirheumatic Drugs help to reduce the risk of permanent tissue and joint damage, your doctor may recommend Methotrexate, Sulfasalazine or Leflunomide. TNF-Alpha levels can be decreased by using PDE4 inhibitors, such as Apremilast (Otezla), which helps to restore the balance of pro-inflammatory and anti-inflammatory signals. There are many options for treating psoriatic arthritis — especially if you and your doctor catch the disease early. It’s important to know that the risk of permanent, debilitating damage increases without early treatment. To give yourself the best chance at a more normal, less painful life, seek treatment immediately if you’ve been experiencing the early warning signs of psoriatic arthritis.